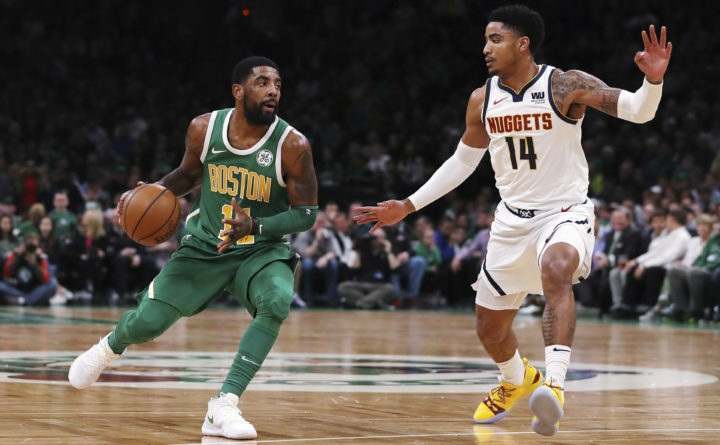 Boston Celtics guard Kyrie Irving (11) drives to the basket against Denver Nuggets guard Gary Harris (14) during the first quarter of an NBA basketball game in Boston on Monday. Thomas started slowly missing two shots, stepping out of bounds and fouling Daniel Theis on his way in for a dunk. He started the second quarter and played a total of seven minutes for the game, finishing with no points and two assists.